This felt stocking is a fast and easy project to get you in the holiday spirit! Create personality and festive cheer through creative embellishments, like ribbon, rickrack, fringe, or sequins. Print out stocking and heel patch templates. To use the stocking template, you’ll need to add 6 inches to the top. Measure on fabric and mark with a fabric marker, or measure and draw a 6-inch by 6-inch square on a piece of paper, cut it out, and tape the piece of paper to the top of the template. Cut a few pieces of ribbon or rickrack to decorate your stocking. If you use ball fringe, you may need to trim away some of the fringe near the sides (to make room for your seam). 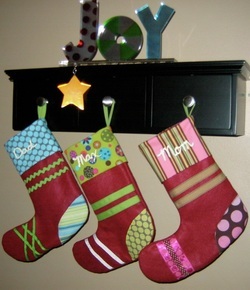 Decide which way you want your stocking to hang—that determines which piece is your stocking front. On the front piece, lay out your pieces of ribbon how you want them. Get as creative as you want with the arrangement. Pin your ribbons and/or rickrack in place. (Picture #1). Stitch by machine (or by hand). Pin the heel patch to the heel. Use a zigzag stitch to attach the top side of the patch (you won’t need to stitch the bottom edge because it will be secured when you sew front to back). Clip curves (make tiny triangle cuts in the seam allowance to help the curves to lay smoother). Fold the 12-inch by 8-inch rectangular piece in half longwise (12-inch sides meet), with WRONG sides together. Press. Now, pin short ends together and stitch. (You now have a circle with one folded edge and one raw edge.) Press seam open. Turn cuff to outside and press. Tack a loop of ribbon to inside top corner for hanging.